After 10 beautiful days in Colorado, our alpine camp has come to an end. The athletes began their week with some pretty cold weather, but it was still nice on the hill! 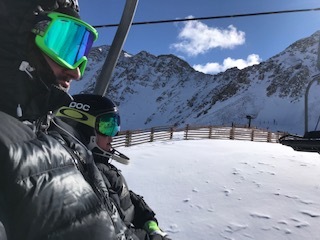 Arapahoe Basin was not crowded, so they took advantage getting a lot of runs and doing a bunch of drills with short segment skiing. The main focus of the camp has been ankle flexion, forward knee and hips up. They have also spent time on edging and feel on the snow. It’s really starting to pay off and the kids are starting to settle into good turns. 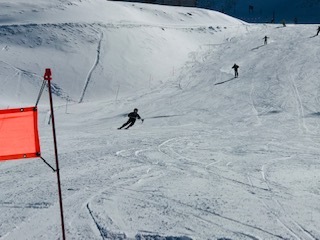 The last two training afternoons were slalom gates on Copperopolis at Copper. All the kids have made really good progress in their skiing and the coaches are excited to get the season going with them back at Okemo. It’s been a great camp with such a close athlete to coach ratio that the coaches feel that the kids have been able to have time to discuss and understand the concepts that they were working on. It has been huge miles for everyone! Before going to the airport on Wednesday, the alpine campers, had a beautiful blue bird day of free skiing at Arapahoe. While they are all sad to leave, they are stoked to be coming home to snow and even more in the forecast here in Vermont! OMS would like to thank coaches, Jet Robbins and Chris Hurka, for going above and beyond to work with our alpine athletes! Without dedicated coaches, the early season camps wouldn’t be possible.